Q. Isn’t Cornell in Washington primarily for government majors? Q. Will credits earned apply toward me major? Q. Does Cornell in Washington follow Cornell's academic calendar? Q. What will my weekly schedule be like in Washington? Q. How does Summer in Washington differ from Cornell in Washington? Q. Am I assigned an internship, or do I arrange one for myself? Q. How likely is it that I will find an internship that’s right for me? Q. Do I have to choose my internship from the CIW database? Q. Why can’t I receive academic credit for my internship? Q. Can I take a paid internship? Q. Who will be my roommate? Q. Is there a meal plan? Q. Should I bring a car? Q. Where should my parents stay when they come to visit me? Q. I want to participate in the program two years from now. What courses will be offered then? Q. How can I find out more about CIW? Q. Isn’t CIW primarily for government majors? A. Not at all. We generally get a fair share of government majors (and other political junkies) in the program. But the majority of students each semester come from a wide variety of other majors, and many of these students pursue interests well removed from government and politics. Invariably, CIW students are a diverse group with a wide range of interests. The program caters to this diversity through its multi-disciplinary curriculum and vast choice of internships. Q. Will credits earned apply to my major? A. You will be earning Cornell credits and we encourage you to check with you advisor or department about how credits and courses will apply to your major. Q. Does CIW follow Cornell's academic calendar? A. Yes. We follow the same start, end, and break schedule. A. 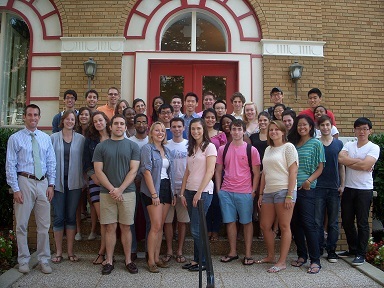 As a participant in the Semester and CAPS programs, you will work at an internship three days a week, typically Monday through Wednesday. The required core courses are taught on Thursday, Public Policy in the morning and American Experience in the afternoon. Elective courses are offered Monday, Tuesday and Wednesday evenings and Friday during the day. During the Summer Program, you can work up to five days a week as long as you enroll in classes taught at night. A. The Summer Program is a shorter (eight-week) program, offering fewer courses and a shorter list of available internships, and six or eight credits rather than twelve or sixteen. It is also open to students of all colleges and universities, and admission is on a first-come, first-served rather than a competitive basis. Q. How much do the Cornell in Washington Programs cost? A. For the Semester and CAPS programs, you pay the same tuition you would pay in Ithaca, and you receive the same financial aid. The rent for your Cornell University Wolpe Center apartment might be a little higher than the rent you would otherwise pay in Ithaca. The cost for the Summer Program is based on the number of credits you take, six or eight. Note for all students: Your clothing and dry cleaning costs might be a little higher because of the need to dress a little more formally for your internship. On the other hand, books should be substantially less expensive. On the whole, the cost of a CIW program should not be significantly different from the cost in Ithaca. A. You select and arrange your own internship, but we provide a lot of help. This applies to all Cornell in Washington programs. Each semester, immediately following the admissions process, we arrange special internship meetings where we provide advice and materials to those just admitted. We maintain a list of more than 1,000 vetted internship positions, an extensive file of evaluations of specific positions by former students, and useful published information. A. Very likely indeed. The number of internships available in Washington is enormous and their range covers just about any conceivable interest. The admissions process occurs early enough to allow you ample time to explore the possibilities, to talk with and visit potential internship sponsors, and to make the necessary arrangements. Best of all, once you’ve applied, there is very little chance you will be turned down—Washington agencies and other employers love to take on CIW students. Q. Do I have to choose my internship from the Cornell in Washington database? A. No. The database is extensive and highly varied, but you can also use one of the specialized public search tools like idealist.org or usajobs.gov. You may even know of a new NGO start-up or online initiative like Linktank (which isn't so new anymore) that is offering internships and that can qualify as well. Wherever you intern, you should make sure that any internship you have found yourself is going to provide rewarding work of the kind you are looking for. A. The list of internships is far larger and more varied than it would be if we required internship sponsors to grade you for college credit. In addition, we believe that it is best if only Cornell faculty assign grades that go on your Cornell transcript. A. Yes, though Cornell in Washington discourages taking paid internships as the pay may affect your academic and overall program experience. A. Let's start with what each apartment contains: a separate bathroom, a full kitchen with refrigerator/freezer, stove/oven/broiler, and sink/disposal (but no dishwasher, microwave, or toaster); independently operated heating/air conditioning units; and Internet access. A. It's your choice, as long as s/he is the same gender. If you already know someone coming the same semester, all the better. Fall and spring semester participants will also have an opportunity to select roommates at the CIW final arrangements meeting held in December or May. A. No. Each apartment has a complete kitchen, and there are several grocery store and restaurants in the neighborhood. A. We strongly advise against it. There is no available street parking near the Center, and garaging a car in the District is expensive. Besides, you simply don’t need a car. We are very handy to buses and the justly admired Washington Metro, and getting in and out of Washington by plane or train is quite easy. We’re in a great neighborhood for walking. A. There are many hotels located within walking distance of the Cornell Cente,r which is located in the Dupont Circle neighborhood. A. Courses are finalized the semester before being offered. Take a look at the courses offered this academic year to get an idea of the range of courses offered. A. You may attend an information meeting held in either late September or early October and again in February. You can also visit Professor Pelletier at our campus office in 300 Kennedy Hall (call (607) 255-4090 for an appointment). Our email address is cwash@cornell.edu. and participation in all School of Continuing Education and Summer Sessions programs.